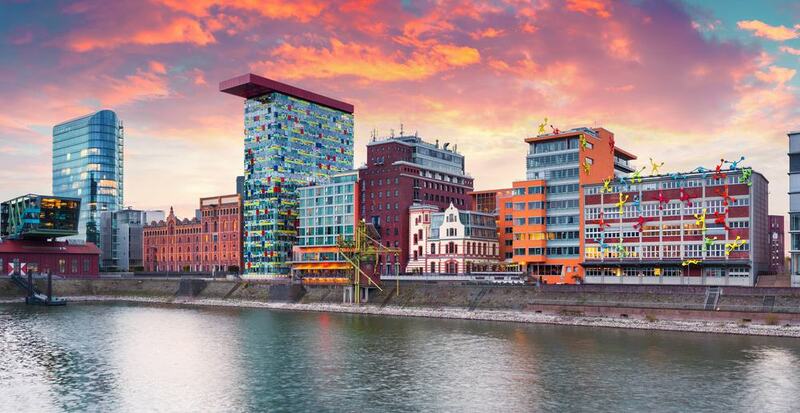 As an international financial giant, Düsseldorf has a well-to-do reputation underpinned by its chic shopping street Königsallee and the revitalised harbour where the big names in architecture have contributed buildings. The city has an earthier side too, and residents and tourists let their hair down and quaff the local Altbier in the historic Altstadt which has hundreds of bars. In July there’s an explosion of fun and levity at the Kirmes fair, a public celebration that is only exceeded by Oktoberfest for scale. And there’s so much culture you may not know where to begin: The city has historic residences and parks built by Imperial Electors, art museums for all eras, cultural centres and medieval churches. When the sun is out it might feel like the whole city has decided to come for a wander at this promenade on the right bank of the Rhine. The walkway is positioned so that it gets sunshine all day long, and bends from the Parliament down to the harbour. The first promenade appeared at the turn of the 20th century, but it’s only since 1993,when road traffic was redirected underground, that it’s been possible to amble next to the Rhine in peace. In summer the scene is almost Mediterranean, in the way the facades glow in the sun at sunset, and long rows of restaurant and cafe terraces are packed with people chatting. At Burgplatz there’s a stairway where people park themselves to read books in the sun, and jetties on the water for cruises on the Rhine. 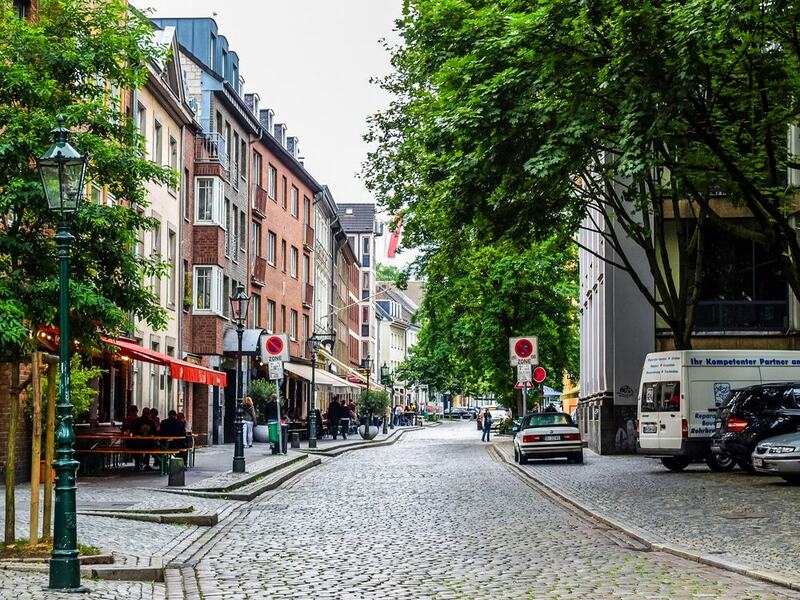 The old town is by no means large, but if you’re planning a night out in Düsseldorf there are more nightspots than you could ever hope to visit. Packed into just a few streets are 300 brewpubs, bars and nightclubs, to the point where the area is referred to as the “Längste Theke der Welt”, “The longest bar in the world”. Although there’s no way to prove it, each bar is claimed to connect with the one next door. The brewpubs in the quarter serve traditional Altbier, which we’ll talk about in more detail later. 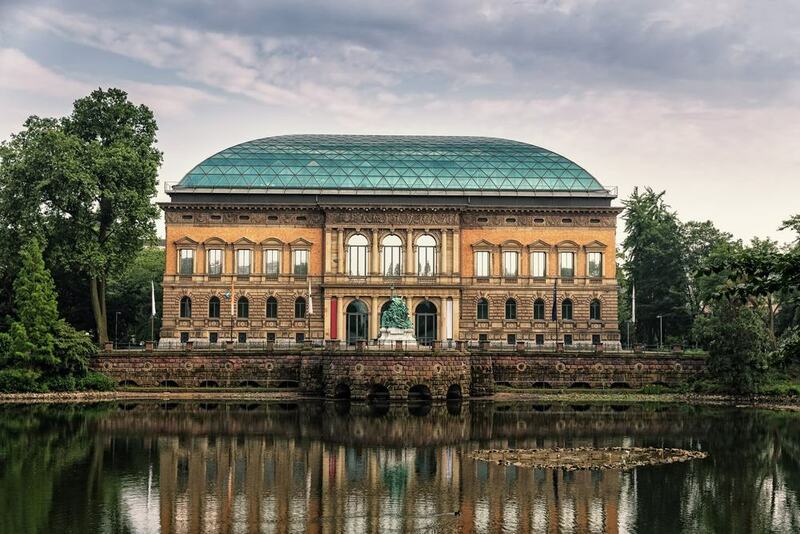 Also take some time to explore with a clear head during the day, checking out the adorable gabled houses and the many cultural amenities in the quarter, like the Kunstsammlung Nordrhein-Westfalen, the Filmmuseum and the NRW-Forum. 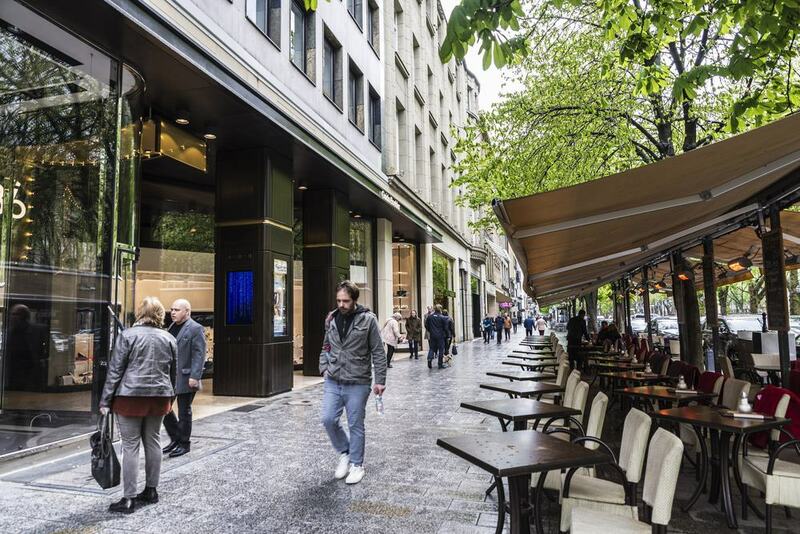 If Düsseldorf is a byword for luxury and high-end lifestyles it’s because of Königsallee, a plush shopping boulevard either side of a canal lined with plane trees. The name is usually contracted to “Kö” by locals, and the street runs for a kilometre north to south, with every premium brand under the sun on the way. For most people it’s a chance to do some window shopping, soak up the affluent ambience and take some photos of the canal and its elegant bridges. But if there’s something very special you need, you’re sure to find it at one of the many flagship stores. Chanel, Cartier, Tiffany & Co, Burberry, Gucci, Louis Vuitton, Hugo Boss and Prada are just a selection. 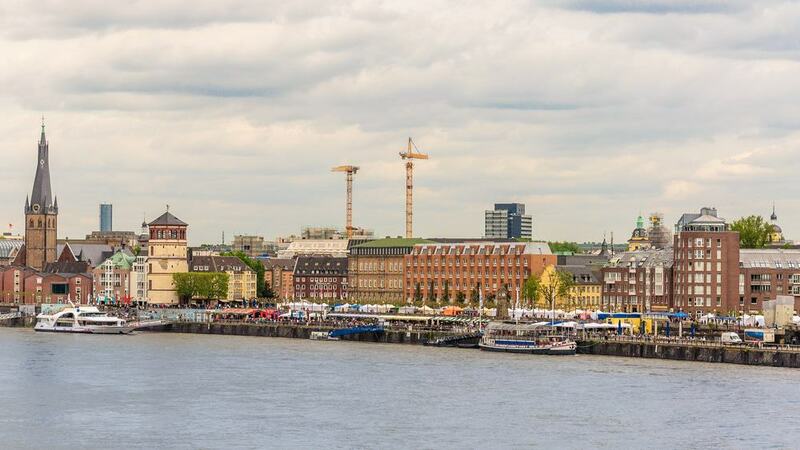 At the southern end of the Rheinuferpromenade are Düsseldorf’s docks, which were built at the end of the 19th century and played a part in the city’s post-war boom. By the 1970s local industry was on the wane, especially after the closure of the local Mannesmann pipe factory. And since the 1990s the harbour has been transformed into a contemporary office district for fashion brands and media firms, but also with restaurants, bars and a cinema. Where possible the 100-year-old warehouses, dock walls and wharfs have been maintained. But they’re accompanied by projects by David Chipperfield, Joe Coenen, Claude Vasconi, and most memorably Frank Gehry, whose Neuer Zollhof complex was completed in 1999 and dominates the waterfront. The tallest building in Düsseldorf is on the east side of the Medienhafen, climbing to 240 metres. This communications tower was unveiled in 1981 and has an observation deck and revolving restaurant at 170 metres. Unsurprisingly, the panoramas are glorious, and merit the €9 entry fee at peak times for adults. When the skies are clear you can easily make out Cologne’s towers far to the south. If you spend a certain amount at the revolving restaurant you’ll also get a discount on your ticket. Entrance also drops to €5 if you come before 11:00 or after 22:00. The tower is open until 23:00 in summer, and the view of Düsseldorf at sunset is as romantic as it gets. Since the tower opened in 1981 its concrete shaft has been decorated with a light sculpture by Horst H. Baumann in the shape of the world’s largest digital clock. 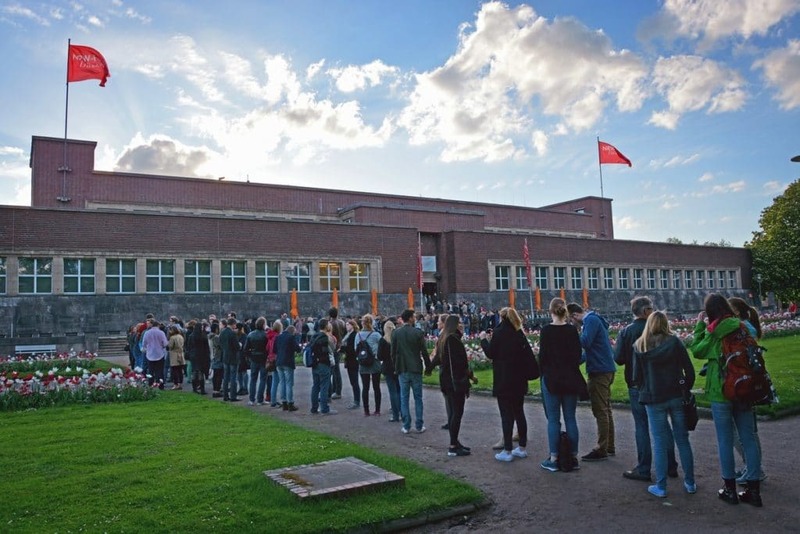 The North Rhine-Westphalia art collection is divided across two main venues, the K20 and K21. We’ll start with the “K20 am Grabbeplatz”, which is in a mesmerising building designed by Arne Jacobsen in the mid-1980s and clad with polished black granite. The galleries are for 20th century art and encompass all of its key movements: Expressionism, Fauvism, Cubism, New Objectivity, Dada, Surrealism, Pop Art and Abstract Expressionism. The volume of great art is unreal. We’re talking about Paul Klee, Kandinsky, Franz Marc, Ernst-Ludwig Kirchner, Picasso, Braque, Fernand Léger, Jackson Pollock, Andy Warhol and many more, so be prepared to spend at least half a day. Under the same umbrella, the K21 Ständehaus is a separate museum space introduced in 2002.The venue is the Neo-Renaissance parliament building, which is magnificent from the outside but even more thrilling inside as its roof has been replaced with a glass canopy and the interior reconfigured into a “piazza”. This floods the interior with natural light, and you can work your way through five floors of art dating from the 1970s to today. In the collection are installations, prints, video art and photography by artists like Candida Höfer, Marcel Broodthaers, Paul McCarthy, Eija-Liisa Ahtila, William Kentridge and Nam June Paik. The museum’s exhibitions are constantly changing, and updated with daring installations like Tomás Saraceno’s interactive “in orbit”, in which you’re encouraged to climb among air-filled spheres on a net suspended 25-metres above the “piazza”. Benrath, just southeast of Düsseldorf is the scene of a lovely Rococo palace from the mid-18th century, surrounded by gardens. 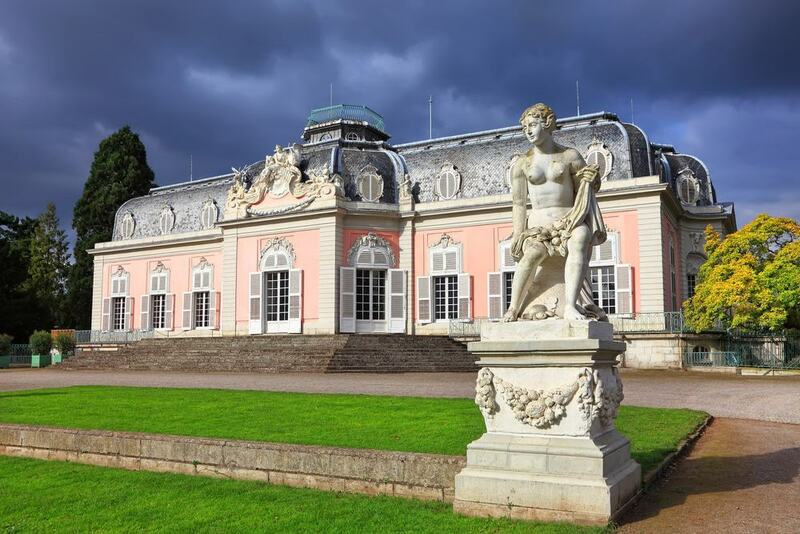 It was all created for Elector Palatine Charles Theodor and his wife Elisabeth Auguste of Sulzbach as a summer residence. The palace was carefully devised to correspond to its gardens, so the Elector’s private room opened onto the English gardens, the Electress’ apartments faced a French formal garden, and the kitchens were served by a potager and herb gardens. On a visit you can tour the opulent Corps de Logis, designed by the Frenchman Nicolas de Pigage, and will have to wear special slippers to conserve the marble floors. In the side wings there’s a Natural History Museum and a Museum to European Garden Art, while that sumptuous park is a setting for concerts in summer. 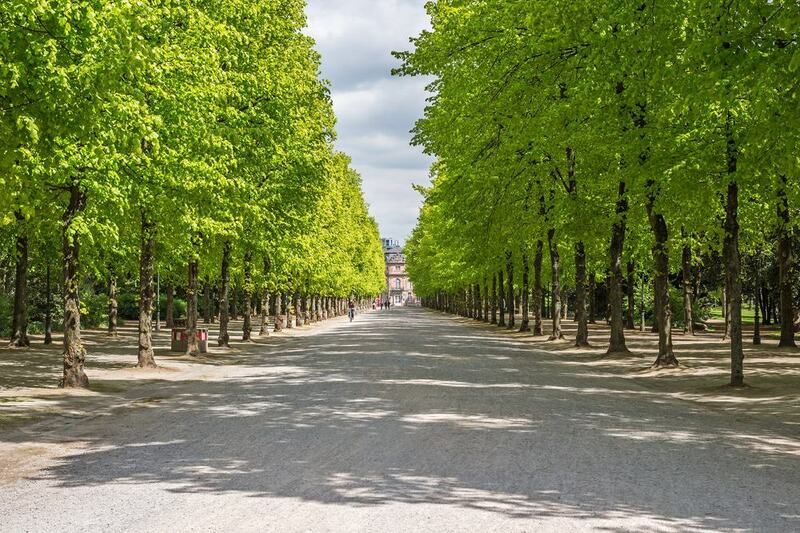 Germany’s first public park was landscaped in 1769 on the back of devastation caused during the Seven Years’ War from 1756 to 1763. The oldest portion is on the east side, between Schloss Jägerhof and the graceful “Jröner Jong” fountain. Working under Charles Theodore again, Nicolas de Pigage was responsible for this section and the long grand avenue linking the two monuments. At the start of the 19th century the park was expanded along the site of walls that had been erected for the Napoleonic Wars, and the park took on its current form. The design would be a prototype for public parks across Germany. There’s a multitude of art installations and historic monuments to seek out, like the Ratinger Tor, one of the old city gates rebuilt as a Neoclassical temple. 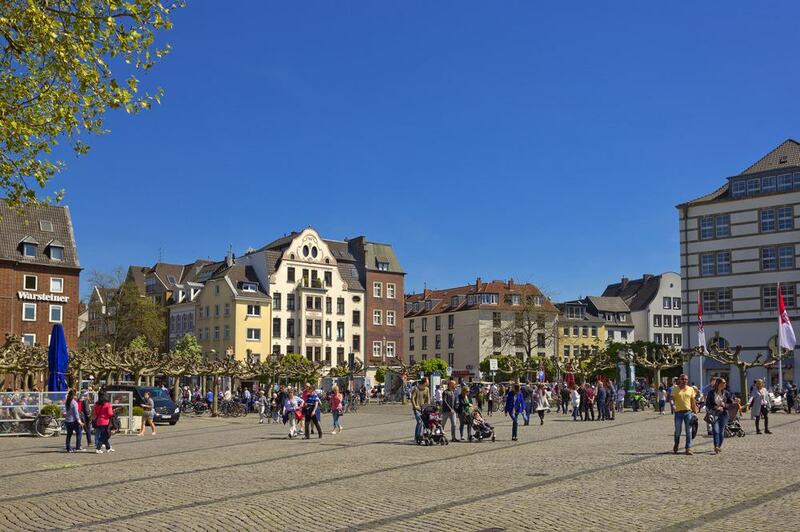 Named for the castle that stood beside the Rhine until the end of the 19th century, Burgplatz is somewhere to meet-up with friends and go for a coffee or beer next to the Rhine. The last vestige of the castle is the Schlossturm. The first three storeys of this tower are from the 1200s, the fourth dates to the 1500s while the fifth was added in 1845. Inside there’s a museum that documents Düsseldorf’s period as an port, the ecology of the Rhine and the history of inland shipping in Germany. 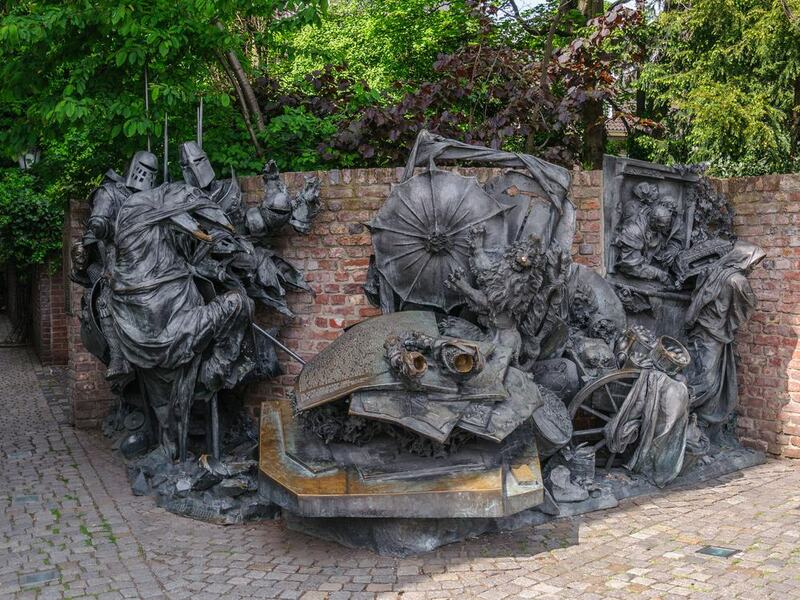 Tucked into a corner of Burgplatz is an ensemble of bronze sculptures cast in 1988 to celebrate 700 years since Düsseldorf was granted city privileges. 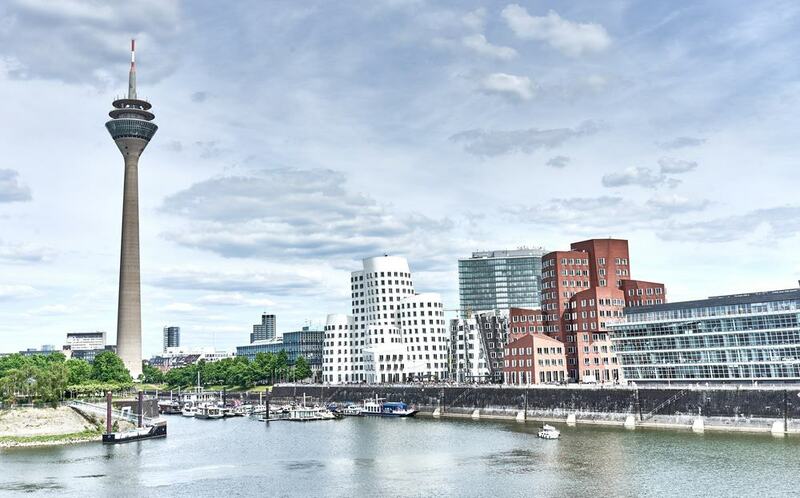 The man behind the monument was Düsseldorf-based artist Bert Gerresheim, and each of the figures he rendered communicates something about the city’s foundation, and with it Düsseldorf’s rivalry with Cologne. On the left is a scene from the Battle of Worringen, one of the largest battles staged in Europe in the middle ages, fought between Archbishop Sigfried II of Cologne and Duke John I of Brabant. Siegfried’s devastating defeat would result in Düsseldorf gaining city status, as depicted in the scene of the document being signed on the right. In prime position in front of the Rhine, the Kunstpalast is the main attraction at the Ehrenhof cultural complex. The permanent collection is a complete chronology of German and European Art, beginning in the Gothic period and ending in the 20th century. The great roll call of artists includes Lucas Cranach the Elder, Rubens, Caspar David Friedrich, Andreas Achenbach, August Macke and Franz Marc. This is combined with vast displays of applied arts, and one of the largest collections of glass in Europe. The museum also abounds with graphical art, in a collection assembled with pieces from across Europe, Japan and the Near East. And beyond all this the museum has made a name for its world-class short-term shows for Caravaggio, Warhol, Miró and Dalí in recent years. Maybe the most photo-friendly location in the Altstadt is the square in front of the Altes Rathaus (Old Town Hall).The name of this trapezoidal plaza comes from the market that traded here from 1482 up to the turn of the century when it moved to Carlsplatz. The “Erwachen” (Awakening), which is the opening ceremony for Düsseldorf raucous carnival, happens in front of the town hall on 11 November. 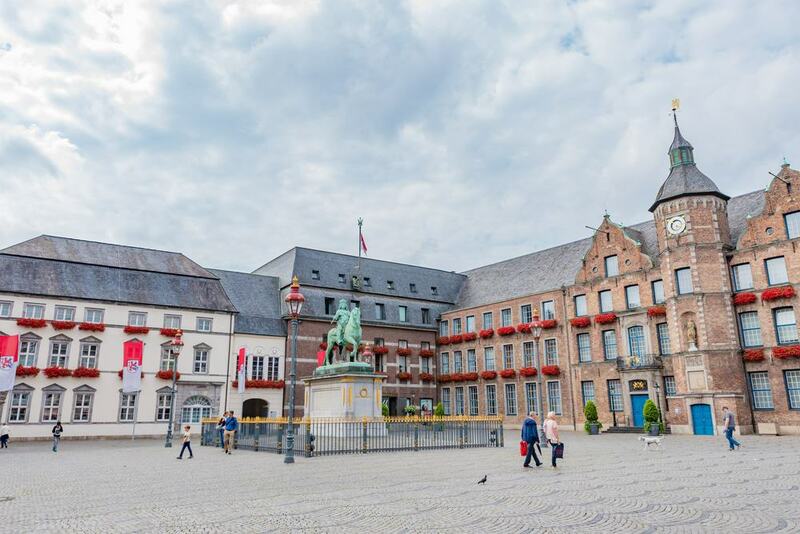 The square is edged on all sides by rows of buildings that are listed monuments, all facing one of Germany’s most feted equestrian statues. The ceremonious monument shows Elector Johann Wilhelm on horseback and was created in 1711 by the Flemish sculptor Gabriël Grupello. Catch the U-Bahn up the Rhine to one of the oldest neighbourhoods in Düsseldorf. The streets of Kaiserswerth are flanked by fine Baroque mansions from the 17th and 18th centuries. Maybe the most photogenic spot is right on the water’s edge at the ruins of the Kaiserpfalz, the imperial castle enlarged in the 11th century by Friedrich Barbarossa and almost obliterated by a bombardment during the War of the Spanish Succession at the beginning of the 18th century. 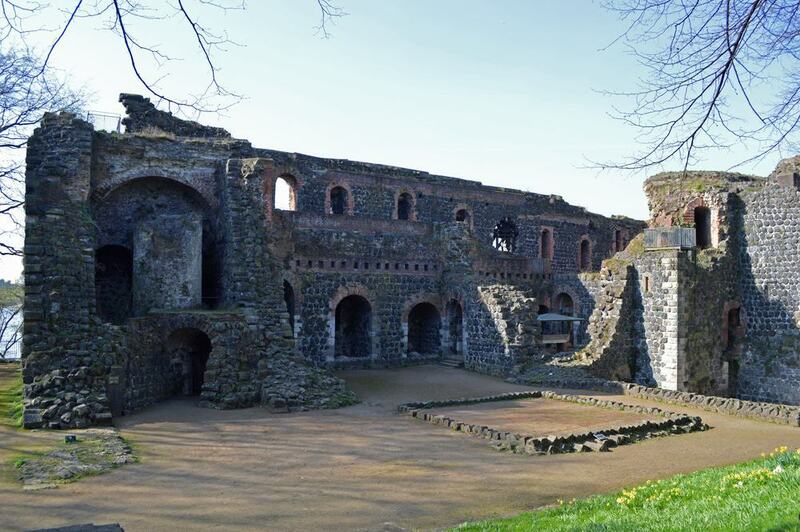 You can view the walls along the lime-edged Burgweg avenue, and also pass some time treading Kaiserswerth’s cobblestone streets, taking breaks at biergartens and cute cafes. Keeping you in Kaiserswerth for a while longer is the neighbourhood’s medieval church, built from volcanic tuff stone and fusing Romanesque and Gothic architecture. 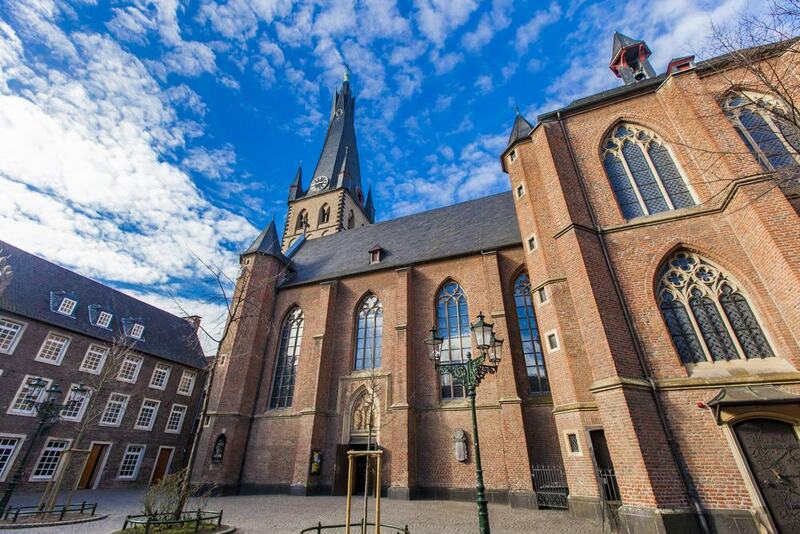 Found on Stiftsplatz, the church’s 12th-century triple-aisled nave dates to the 12th century, while the Gothic choir is from around a century later. This is where you can find the remains of the 8th-centruy St Suitbertus, contained in a richly ornamented reliquary. The relics were brought here in 1264 and placed in a chest carved from oak and then plated with gilded copper. There are reliefs depicting the apostles on the sides, and on the cover are scenes from the life of Jesus. East of the centre of Düsseldorf there’s an animal park in a 200-year-old beech forest. The Wildpark concentrates on species native to Germany, and the habitats are all open and linked by a three-kilometre walking trail. 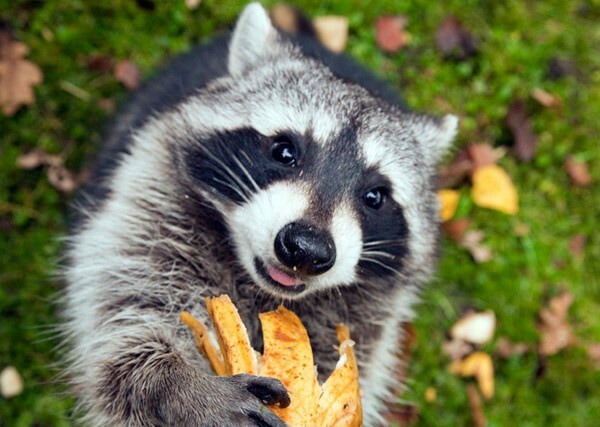 You’re encouraged to take apples and grains with you to feed the animals. The park is free to enter and open all year round. There are about 100 animals in total, among which are several species of deer (roe, red and fallow), as well as mouflon, wild boars, pheasants and wildcats. The park also has an apiary where a beekeeper will give live demonstrations. One of the defining features of Düsseldorf’s skyline is the twisting tower of the 14th-century Sankt Lambertus church. The tower’s peculiar appearance isn’t intentional; it was constructed in 1815 following a fire, and before long the timbers warped. There are lots of bawdy stories attached to the tower; one says that the tower turned away in shame when a woman came to the altar pretending to be a virgin, and will twist back again when a true virgin is married at the church. There’s a great deal of art awaiting you inside, like the 15th-century frescoes of the Crucifixion and Virgin with Child, and the Italian High Renaissance tomb of the nobleman Herzog Wilhelms von Jülich-Kleve-Berg. 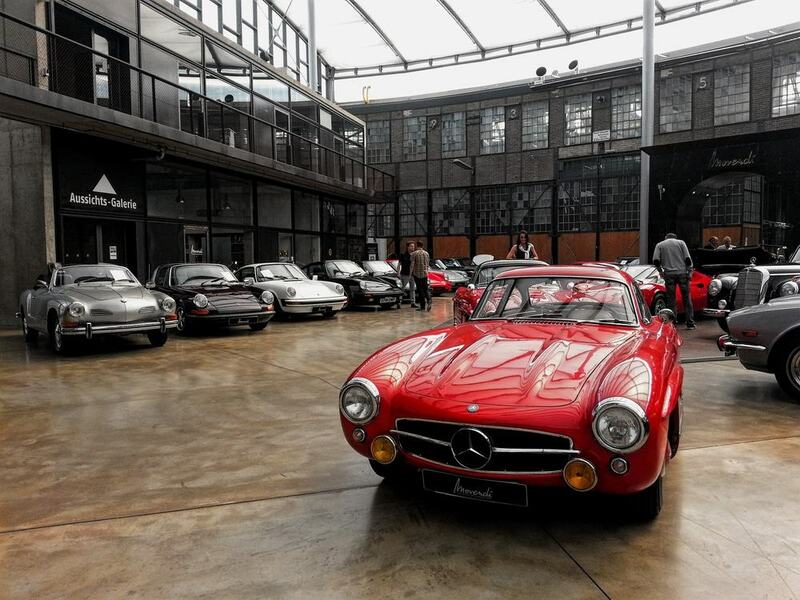 At a converted steam locomotive roundhouse there’s a jaw-dropping fleet of classic cars you can see free of charge. That’s because the Classic Remise isn’t so much a museum as a facility where beautiful vehicles from the 20th century are restored, looked after and sold. You can watch expert restorers at work, giving a new lease of life to vintage Mercedes-Benzes, Porches, BMWs, Lamborghinis, Aston Martins and Ferraris. The old industrial architecture of the roundhouse sets the cars off perfectly, and many are stored in twin-level glass cubes to regular the environmental conditions. Just south of the Altstadt, Carlstadt is a small city borough founded on a grid system by Elector Charles Theodore in the 18th century. Most of the houses still have their Baroque and Neoclassical facades, in a posh neighbourhood of galleries, boutiques and antiques shops. After searching for a special little something on Bilker Straße or Hohe Straße you can take a break at a chic cafe or restaurant to put the icing on an indulgent afternoon. You’ll be following in some exalted footsteps, as the 19th-century’s musical power couple Robert and Clara Schumann lived at Bilker Straße for a time in the 1850s. In Casrlstadt you can also pop into the oldest market in Düsseldorf. Apart from a hiatus in the Second World War, the market has been trading here since 1910 after moving from Marktplatz. The vendors now have permanent stands sheltered by a canopy. And befitting the neighbourhood, what used to be a market for everyday groceries is today more of a gourmet culinary destination. If you stop by at lunch there’s a cosmopolitan choice of food to-go, like bratwurst, kebabs, soup, potato pancakes and crêpes. 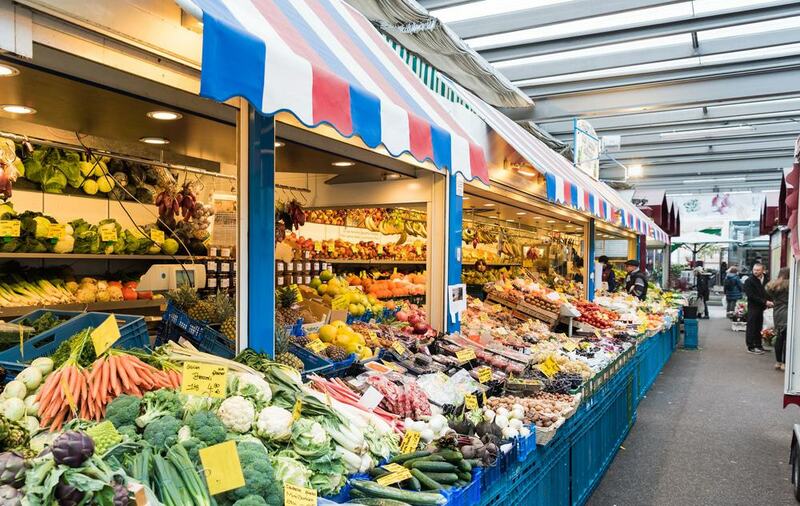 And you can still call in for some supplies at the stalls selling fruit, vegetables, meat, cheese, seafood and specialty foods at the delicatessen counters. If you’re into contemporary art and pop culture, one of your priorities should be to find out what’s on at this exhibition centre in the Ehrenhof complex. The NRW Forum puts on shows for contemporary art, design, fashion, digital culture and photography. To give you a taste there have been exhibitions for Vivienne Westwood, Martin Kippenberger, Anton Corbijn, Andy Warhol, Alexander McQueen, Bettina Rheims, Michel Comte over the last 15 years or so. At the time of writing in 2017 there was a photography exhibition, “Women on Street” by Garry Winogrand (posthumous) and Peter Lindbergh. You can use the S-Bahn to travel east to the Neander Valley (Neandertal). If you recognise the name it’s because this was where the first Neanderthal Man was discovered in 1856. The museum was established on the site in 1996 and together with its indoor galleries there’s an archaeological park where you can see the very spot where the first specimen came to light. In the museum you’ll come face-to-face with models of Neanderthals based on real fossils and will be informed about their behaviour and the mass migration that brought them from grasslands in the east to western Europe. There’s also an exhibition about the different branches in the evolution of man, and a collection of casts illustrating the development of early hominids. The museum has a lot of information to get through, but the English audioguide breaks it all down. One of the rituals that you have to take part in is to hit the Altstadt for a glass of Altbier. The beverage has a dark reddish tone and gets is called “old” as it uses top-fermenting yeast (the old way to make ale). This beer is fermented at a moderate temperature, but then matures at quite a cool one, which gives it a crispness and taste closer to lager than a traditional ale. 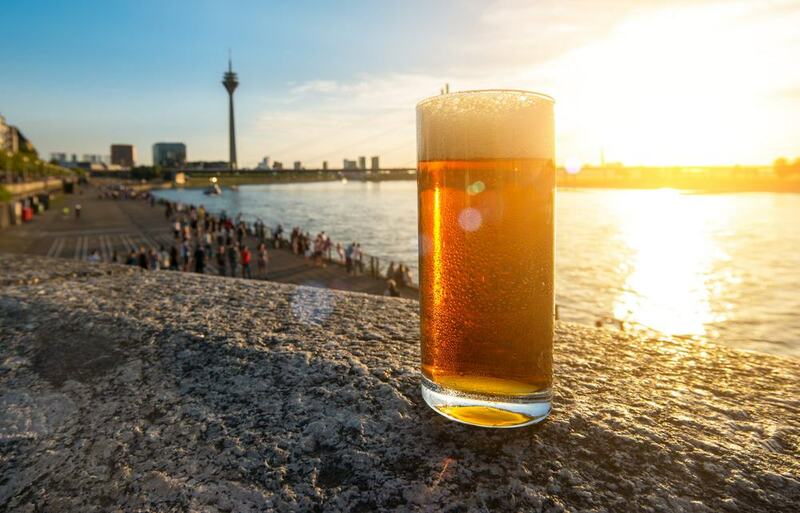 If you’re interested in sampling the nuanced differences in varieties, there are five microbreweries in the Altstadt, while the city’s tourism board organises guided tours. And if you really want to do things the Düsseldorf way, pair your Altbier with roasted pork knuckles and a side of French fries. 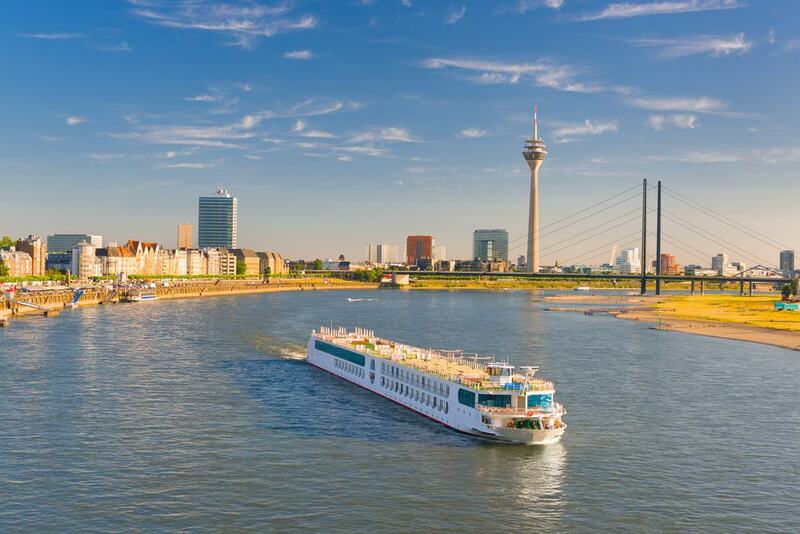 In summertime step aboard a boat and see Düsseldorf’s skyline from the Rhine. There are two cruise companies, Weisse Flotte and KD, offering hour-long trips, free refreshments and a running commentary over a loudspeaker in both German and English. One area best viewed from the water is the Medienhafen, cruises departing from the Rheinuferpromenade head straight for this neighbourhood. The boats won’t actually stop in the quarter, but will plot a course around the canals for a closer look at the modern architecture and Gehry’s Neuer Zollhof. You’ll cruise under the Theodor Heuss Bridge, the first cable-stayed bridge in Germany when it was completed in 1957. Between the second and third weekend of July, the “Largest Fair on the Rhine” takes place on the left bank of the river. 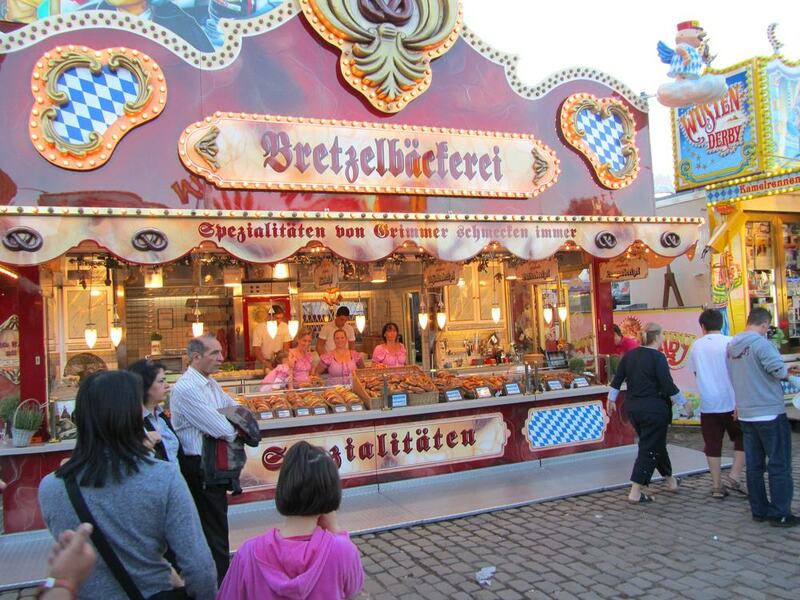 The fair is the largest celebration in Germany behind Oktoberfest and Stutgart’s Canstatter Volksfest, and pulls in more than four million revellers each year. Kirmes has deep roots as a religious festival for the patron saint Apollinaris of Ravenna and the Sanctification of the Sankt Lambertus Basilica, both going back to the 15th century. The theme is less religion-oriented today, and people descend on the fairground for old-time amusements, roller coasters, carousels an epic Ferris wheel and all sorts of white-knuckle rides. The Monday is “Pink Monday”, a special day for the city’s LGBT community, while on the Tuesday there’s a marksman’s competition organised by the 700-year-old St.